After kit review #1 a few months ago, here’s the second in a series of blogs reviewing some of our best bits of equipment. Camping is the norm for touring cyclists around the world, but in Southeast Asia the combination of wet days, hot nights, rice fields covering lots of the flat land, and an abundance of cheap guest houses meant we decided against carrying the weight of a tent, 2 sleeping mats and 2 sleeping bags (probably 7kgs worth and a couple of panniers full). We imagined we’d be finding guesthoues each night, but we also wanted to be able to sleep independently if needed. So we decided to carry a pair of hammocks (Ultralight Hammocks from Lifeventure). They weight about 600 grams each, pack down very small and can be strung up between two trees in seconds. Hammocks are commonplace in this part of the world, and we saw them hung up outside most cafes and village homes as we cycled along. The locals seem to agree – there aren’t many better ways to spend a hot afternoon than swinging in a shady hammock! Most of the local hammocks were of the string net variety, but ours were made from solid black fabric – vital to keep the mosiquitoes out (when combined with a mosi net) whilst sleeping out. They’re also surprisingly long (another advantage over local hammocks) – I’m way over 6 foot tall but still had plenty of room to spare at each end. Overall, we found the hammocks really comfy and are glad we carried them through Southeast Asia. Although it was almost too tempting to stop cycling and have a sneaky rest break swinging under a tree (or a hut, as pictured below)! Hammocks are so much smaller and lighter than the traditional tent & mat combination that people that like to travel ultralight really should consider taking one on their next trip. Mosiquitoes are an annoyance throughout most of Southeast Asia, and if they’re around then it’s guaranteed that at least one of the little buggers will find a way to eat you during the night. Cheap guesthouses rarely provided nets, so we strung our net up every night whilst in Southeast Asia, and now class them as essential kit for this part of the world. We have one each, in case we’re in our hammocks or a guesthouse gives us two single beds, but one of them can stretch to cover a double bed if needed (Lifesystems BoxNet). The four hanging cords means it’s nice and roomy inside, and although we’ve had to be inventive, we’ve always been able to tie it up. The other net (Lifesystems UltraNet) is lighter, smaller and simpler, with only one hanging cord. It goes up much quicker, but there’s much less room to manoeuvre inside – fine if you’re travelling light by yourself, but two people won’t fit. We both have Brookes B17 saddles, a common choice amongst long-distance cyclists. Everyone who sees our bikes slaps the firm leather surface, wonders why we don’t have a massive soft seat and asks if we’re mad. The theory is that the wide leather part supports your sit bones, thereby keeping weight off other more delicate areas. The theory seems to work, as we both find them comfortable – I don’t even wear padded shorts and my rear end has been fine all trip. However, Bex has some problems from time to time with the edges of the saddle rubbing as she pedals, causing some chaffing. We think the overall shape of the saddle perhaps doesn’t quite match her bum – everyone’s a different shape, so saddle choice is a very personal thing. Definitely something to test out before you leave on a big trip! As an aside, leather stretches when wet (clearly bad news for a saddle), so put a cheap plastic seat cover (or shopping bag) over the saddle when it rains. Basically a thin cotton tube that fits over your head, Buffs are great as a warm hat/face mask/bandana/neck warmer/balaclava/sweat band etc etc, depending on how you wear it. Back in the Central Asian winter we wore a couple balaclava-style to keep the ice out, but now we’re in hotter climates they’re good when dunked in water and left to drip down our necks as we cycle in the midday sun along with the mad dogs. If you cycle all day and then dive straight into your sleeping bag, they can quicky get dirty and washing sleeping bags whilst on the road can be hard. Using a silk liner inside your bag to collect the dirt is a good idea as these can be washed much more easily. They also add a few degrees of warmth, so are useful when it’s cold. In hot countries they can be warm enough on their own, or if there are a few too many suspicious stains on the sheets in a budget guesthouse. A useful bit of kit at only 130 grams. During 2011 I’ve been continuously updating a Flickr album with my favourite photo each week. Now the year’s over, it’s been fun to have a quick look back over the 52 photos to get a nice random selection of snapshot memories from the last 12 months, from Turkey to Australia. Which is your favourite photo? Let me know in the comments below! This post originally appeared in the guest photo Friday slot on Alastair Humphreys’ blog. A bicycle is possibly the best method of transport to see the changing landscape as you cross the world. Exposed to the sounds and smells, connected to the distance in a way that just isn’t possible from behind a bus window, and yet still fast enough to be able to cross continents. We’ve watched the world morph between flat green European fields, snowy Turkish plains, endless Kazakh steppe, deserts and mountains in Central Asia and lush green paddy fields in Southern China. Religion is central to life all over the world and the changing influences are unmissable when crossing continents. The dominate religion across the Eurasian landmass changed gradually through varying degrees of Christianity, Islam and Buddhism, with plenty of other beliefs mixed in along the way. Life on the road produces extreme highs and lows from everyday situations. A relentless headwind and an expiring Turkmen visa combined to produce one of the worst weeks of the journey, whereas conquering the final winter mountain pass in east Turkey resulted in ear-to-ear grins that lasted all the way down the freezing descent. Usually the cheapest and easiest way to fill a hungry stomach, bread is the staple of choice for many a long distance cyclist. We’ve enjoyed sampling the bread in every country we’ve cycled in: the baguettes of France, the dark and heavy brot of Germany, the flatbread of Iran and the circular loaves of Uighur bread in Xinjiang. My favourite? Without a doubt the simits of Turkey – shaped like a bagel and best served hot, these delicious treats fuelled 2,000km of cycling across Turkey (washed down with the obligatory cups of tea, of course!). Most of our fondest memories are of the people we’ve met. Some cities, otherwise anonymous, are remembered with great fondness simply because we had a fun evening with new friends. The incredible hospitality of the Iranians, cups of tea from friendly truck drivers, the vodka loving Uzbeks, the impenetrable language barrier of the Chinese, crowds of kids wanting their photo taken with the weird foreigner – all memories that will remain long after our saddle sores fade. The need to find a new cheap or free place to sleep every day conjures up plenty of interesting situations. The appreciation of a bed and shower is in direct proportion to the level of discomfort experienced the night before! Swift and unexpected changes in fortune were one of the best things about cycling through Turkey and Iran in winter – one day we’d be sleeping in a sub-zero tent in a tunnel under the road, with hastily cooked camp stove slurry for dinner. 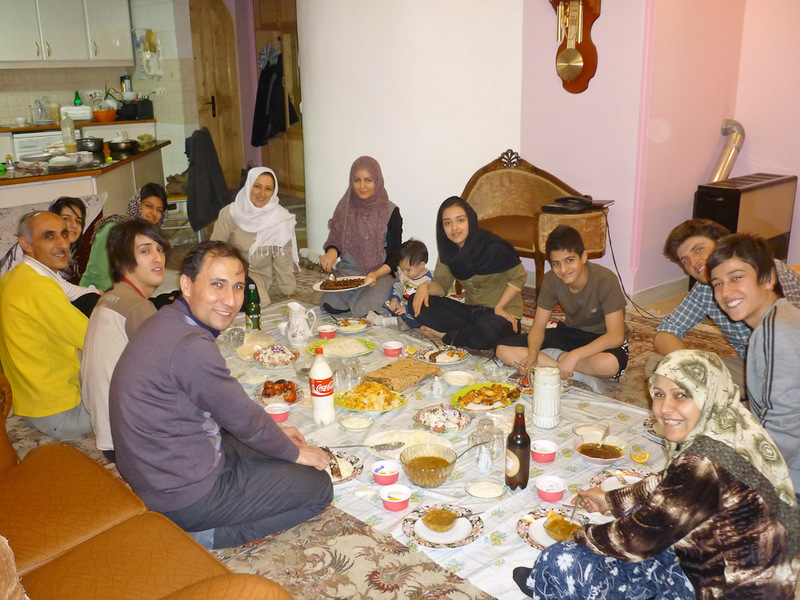 The next, we’d find ourselves with a warm bed, hot shower and delicious meal, surrounded by the friendly faces of the family who had invited us into their home for the night. The road is a blur, my eyes are half-closed and my soaked shirt sticks to my back. Water runs down my nose, stings my bare arms and covers every surface. It’s wet season in this part of the world, and when it rains it really, really hammers down. Local moped drivers shelter under bus stops, staring in bemusement at the crazy foreigners cycling through the storm, but our clothes will dry out quickly once the sun returns so we see no point in stopping. And anyway, the cool rain is a nice change from sweating in the sun. We’ve had a few of these downpours since we left Bangkok, heading due south towards various big name tourist destinations and the Malaysian border. Cycling out of Bangkok was predictably bleak, but within 5 days we’d reached the ferry port for Ko Tao, an island off the east coast renowned for diving. We spent an excellent few days relaxing on the beach, snorkelling amongst colourful fish and bursting into laughter whilst trying to remember what it felt like to slog through Chinese deserts for weeks on end. Times have changed! After catching the ferry back to the mainland we met with Mark & Hana (two Kiwis cycling from China to Indonesia) in the port town of Chumphon. We’d met in Bangkok and were all keen to cycle together for a while, so we joined forces and continued on our way. To avoid the flat busy highway that runs down the east coast we followed a small road over to the west coast and spent the next 4 days cycling through areas struck by the Boxing Day Tsunami of 2004. Since then, evacuation routes have been signposted and warning sirens constructed in an attempt to protect people should another tsunami happen in the future. Those 4 days were the wettest yet – it barely stopped raining! Apparently it was a particularly dodgy weather system, but in any case it was great to have the company of a 4-man peloton for a change to keep morale high. Mark is a professional photographer and his collection of shots from their cycling trip are superb and well worth a look. I must’ve asked a million questions over the few weeks we spent together trying to garner as many tips as possible – thanks for being so tolerant Mark! Although he’s a few weeks behind in processing his photos, we’ve seen a few sneak previews of the shots from our time together and they look great – hopefully we’ll be able to post links to a few of Mark’s photos in our next blog. We took a longtail boat to Railay Beach, a peninsula framed by huge limestone cliffs which make it inaccessible by road. It’s a famous spot for rock climbing and the cliffs create an incredible backdrop. Wild monkeys stormed the beach to steal bananas from sunbathing tourists, and bats raced laps around a circuit of trees as night fell. As we reached the far south of Thailand, mosques started to pop up in amongst the Buddhist temples that have been a daily feature throughout Laos and Thailand. The last day or so in Thailand felt like a completely different country, with most communities being entirely Muslim. This change was a prelude to the border crossing to Malaysia, where Islam is the dominant religion throughout the country. Like the other Muslim countries we’ve visited, the vast majority of women (in rural areas at least) wear headscarfs, every village has a mosque and our wake up call is the distinctive call to prayer. Well it would be, but with only minor whimpering from Bex we’ve slipped into Mark & Hana’s cycling regime which involves a pre-dawn alarm with the aim of being cycling before sunrise. This lets Mark get the best light of the day for photography, and also gives us most of the afternoon ‘off’ in whichever town we end up in. In Alor Setar we arrived for a late lunch at one of the ubiquitous large Indian cafes, eating biryani and roti, before an evening photography session at the awesome Zahir Mosque. The roads in Malaysia are noticeably busier, and it’s become harder to find the quieter back roads that make cycling so much more fun, whilst still heading in roughly the right direction (i.e. south!) On the rare occasions we have found nice quiet roads we’ve been rewarded with road-side stalls selling bananas, wild monkeys jumping from tree to tree and thick jungle scenery, although unfortunately much of the natural wild jungle has been chopped down and replaced by palm oil plantations. We caught the ferry across to the island of Langkawi and cycled 25km to the far side to spend another few days relaxing in the company of Mark & Hana and enjoying a few killer sunsets. Having travelled in Southeast Asia before, Bex always said she was looking forward to this part of the trip, and now I can see why! The number of spectacular sights and relatively short distance between them makes it perfect for travelling by bike. What suprised me, however, is that we haven’t seen a single foreigner on any of our cycling days between the well known spots. Even in Thailand & Malaysia, it seems it’s incredibly easy to see local villages and normal rural life from the saddle, just by cycling anywhere. The last few kilometres into Kuala Lumpur were relatively relaxed, aside from one particular 4km stretch. While Bex hates it, I usually enjoy riding into massive cities as the busy traffic keeps the adrenaline pumping and all senses alert. But when the 4 of us popped out into the middle lane of a 5 lane motorway a bit too much adrenaline was involved even for my liking! It felt like we were lacking a few wheels and a seatbelt to be mixing it with the cars. We turned onto a smaller road at the first opportunity, before saying goodbye to Mark & Hana. We ended up cycling 1,400km together in total, but they’re now flying to the northern tip of Sumatra for the epic next leg of their adventure. It’s been really great having some fun and interesting company for a few weeks, and having some other people to share experiences. Thanks for an awesome time guys, and see you in NZ!